Does The VooDoo Aizan 29er Mountain Bike Offer More Than An Attractive Frame? A quick glance at the feature list for the VooDoo Aizan 29er Mountain Bike shows that its has plenty of basic components to be a great choice for mountain biking. 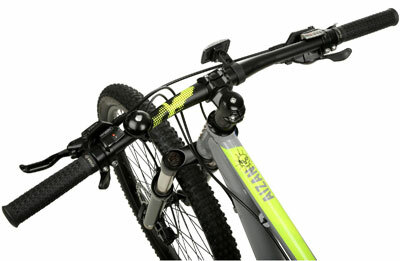 In addition to the 29er wheels and frame, there are 27 gears and 120mm Suntour forks for shock absorption. With its massive wheels and bright orange frame, it is easy to stand out when riding this Aizan model, but does it offer the performance that users are after? What advantages have buyers mentioned in their reviews for this VooDoo Mountain Bike? The phrase that seems to be repeated the most in consumer reviews of this VooDoo Aizan Mountain Bike is that it is a great “all-rounder” and is more than just a mountain cycle as it can handle most routes placed in front of it. It has been used with ease for on and off-road riding thanks to those 29er wheels and the fact that the suspension can be locked to make it more comfortable for a road riding and unlocked for country terrain. On that note, there is also praise for how tough this VooDoo 29er mountain bike seems to be; buyers have tested it out to its full potential on long rides and been impressed with what it can achieve. Another key benefit that has been highlighted is the high quality within the bike’s parts and construction. The Tektro hydraulic disc brakes and Shimano gear shifters in particular are reliable and responsive and some have gone as far as saying that the bike “lives up to its reputation” as it does precisely what they would expect from a VooDoo bike. 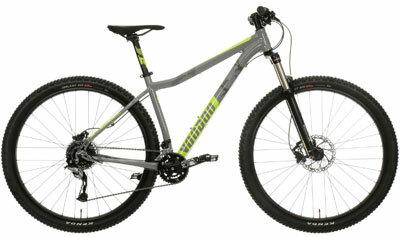 Finally, there is the minor benefit that it is an attractive MTB that has received compliments from other riders. At the moment it seems to tick all the right boxes but there are some minor details where buyers have found fault. What disadvantages have riders noticed when testing out the capabilities of this VooDoo Aizan 29er Mountain Bike? There are some buyers criticising the weight of the bike even though it boasts a “lightweight” 7005 aluminium frame. Despite this, these riders are still pretty happy with the speed that can be achieved and have not reduced their overall rating from 5 stars, which shows that this really is a minor issue. In fact, the vast majority of consumers are awarding this bike great reviews and have little else to say in terms of negative feedback. The skinny seat is a little bit uncomfortable for some but this is nothing new and it usually one the easier, and first, components to be replaced when upgrading and personalising a bike. Summary: does this mean that the VooDoo Aizan 29er is a highly recommendable ride? Weight and small, interchangeable components are minor issues that can be easily overlooked or rectified when a bike is able to offer a great performance and plenty of other high-end features – which is precisely what has happened here. Some would endorse this model based on the reliability and security that it has offered through its branding and specification while others would do so because of the versatility in its performance as an on-road and off-road bike. Either way, it is clear that there is something for most keen riders with this VooDoo 29er bike and it is therefore impossible not to recommend it for purchase. Find more reviews about the Voodoo Aizan 29er Mountain Bike on Halford here. Copyright © 2019 · Mountain Bike Reviews, All Rights Reserved.